By using SSL for email, you ensure that communications between your personal computer and your server will be encrypted. Your message contents, username, and password will be hidden from eavesdroppers -- but only hidden from eavesdroppers between you and your server! SSL services do not protect your messages once they leave your SMTP Server and head to their destinations. Even though your message contents are not necessarily protected, it does completely protect your username and password from detection. This is very important because it prevents identity theft, forged messages, etc. These instructions are for Plesk Onyx (17) and above. Instructions for older versions of Plesk are included below, but it is strongly recommended that you upgrade Plesk to the latest version. Plesk Onyx introduced the ability to quickly secure your mail server. 1. Log into your Plesk admin panel. 3. Install your Media Temple or third-party certificate. If you do not already have a certificate to use, you can either install a free Let's Encrypt SSL, or purchase one from Media Temple. Important note: It is recommended that you use "mail.domain.com" for the SSL used to secure your mail server. 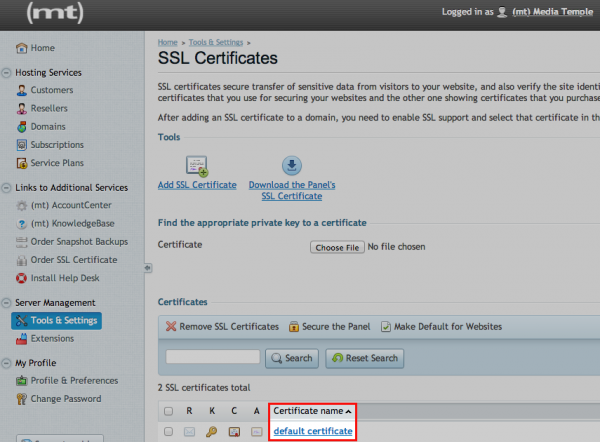 This will help you avoid popups regarding mismatched SSL certs and hostnames. 4. Once your certificate is installed, locate the "Certificate for securing mail" field and click on Change. 5. Select your certificate from the list and click OK. Your mail server is now secured with an SSL. If you need to setup your own certificates, you should copy your certificate and private key into the appropriate files and restart qmail and/or courier-imap/Dovecot services. Instructions for both Dovecot and Courier mail servers are included. Plesk versions 12.0 and later are provisioned with Dovecot as the default. Previous versions use Courier, but have an option to install Dovecot. 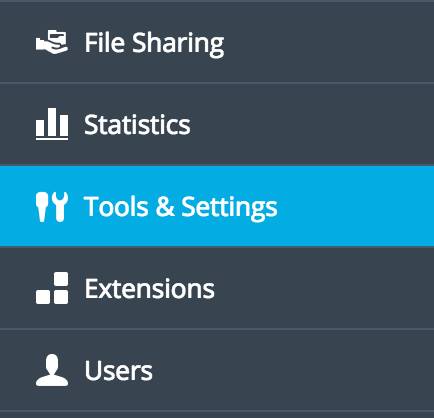 If you are unsure of which software you are using or want to use something different, log into your Plesk control panel and navigate to Tools & Settings >> Mail Server Settings. There is a single certificate for each of these services: SMTP, IMAP4, and POP3 over SSL and several various certificates cannot be used for various Plesk domains. Make sure to specify the domain name for the certificate in order to avoid "domain name mismatch" warnings. For example, if the certificate was issued for the "dv-example.com" domain, then you should specify "dv-example.com" in your mail client preferences for SMTP/POP3/IMAP servers. 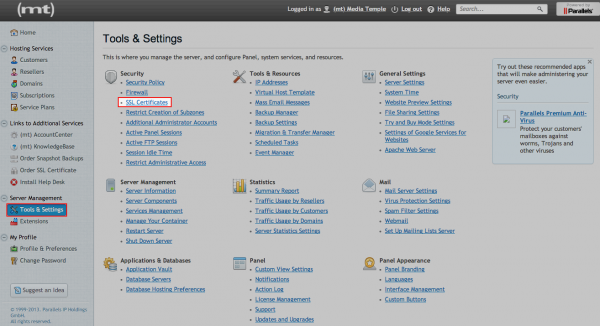 Access to your Server Administrator Panel. This article is provided solely as a courtesy to our customers. Please take a moment to review the Statement of Support. Log into your Plesk Server Administrator Panel. 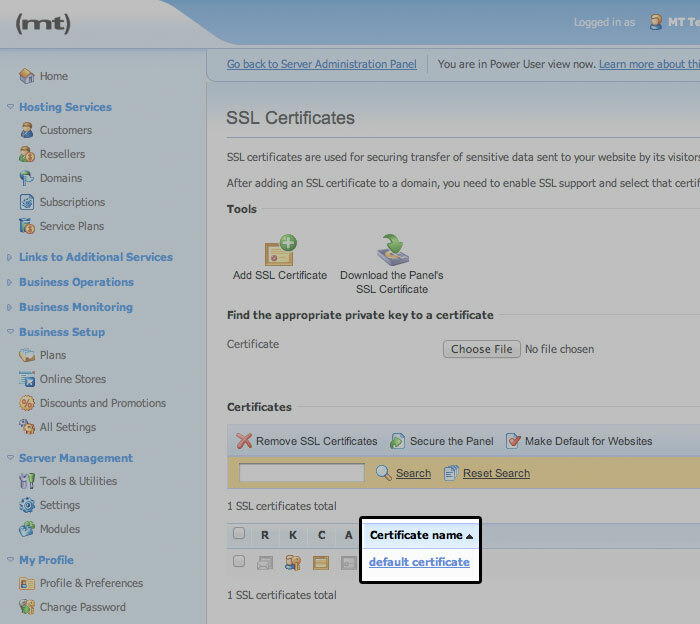 From the left navigation menu, click on Tools & Utilities and select SSL Certificates. Click on the default certificate. Scroll down until you see the sections Private Key and Certificate. Copy the contents of each section into a new file on your server and name the file with the .pem extension, e.g. dv-example.com.pem. Save this file to the /usr/share/courier-imap directory. Your file should look similar to this. Connect via SSH to your DV as the root user. Before editing system configuration files on your server, backup files should be made first. Enter the following two commands, one at a time. Next, you will need to edit the same line on these two files separately. The line begins with TLS_Certfile=. You can easily jump straight to editing that line with the following command which you will use for both files. The default certfile being used points to a file in /usr/share/courier-imap/. You want this to be your pem file instead. Change that line to point to your file which you saved earlier in that directory. Your two files should look like this snippet. Be sure to replace dv-example.com with your domain. We also need to have qmail use this certificate. Make a backup of the default servercert.pem file and use your cert instead with the following two commands. Restart the mail services on your server. You should see the following successful output. Now, you and your site users should be able to use your SSL certificate to securely send email using various mail programs. 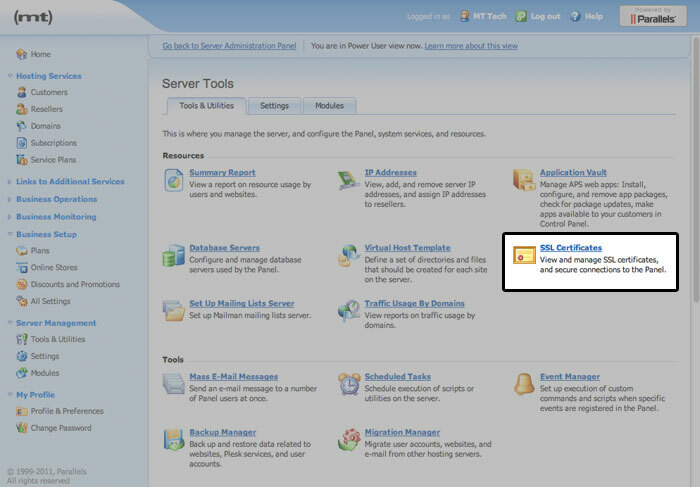 From the left navigation menu under Server Management, select Tools & Settings. Under Security, select SSL Certificates. We also need to have postfix use this certificate. Make a backup of the postfix_default.pem file and use your cert instead with the following two commands. 1. SSH to your server as the root user. In order to do this, you must first make sure that you have root login enabled from the account center. 4. Copy the replacement key and ssl certificate into and create the dovecot .pem.replacement file. 5. Replace default dovecot .pem file with dovecot .pem.replacement file. 6. Replace default postfix .pem file with SAME dovecot .pem.replacement file. 7. Verify permissions (0400) and root ownership (root:root) of newly-replaced dovecot .pem file. 8. Verify permissions (0600) and root ownership (root:root) of newly-replaced postfix .pem file. 9. reload-or-restart dovecot and check service status. Depending on your email client, you may receive a certificate error. 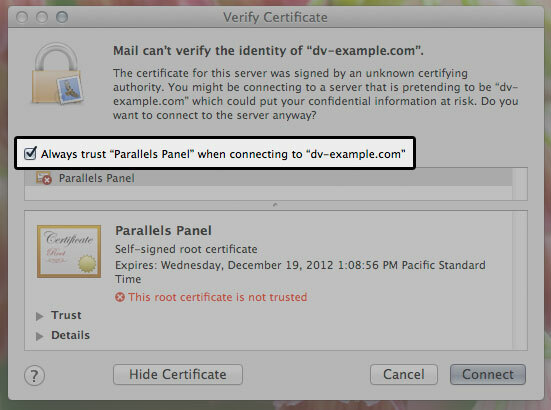 Check the box to trust the certificate and eliminate the certificate error messages for your mail client. How do I enable or disable Power User mode for my DV?